Like most people, I don’t enjoy having my view of a live concert blocked by someone filming the performance on their phone, but I understand their need to try it. Heck, I’ve done it myself when I saw my favorite band 6,000 miles from home and when a couple of close friends played an intimate gig in my hometown. Apple’s latest patent might help the company put a stop to all that. The company has devised a way to prevent your phone camera from recording footage, using infrared signals. 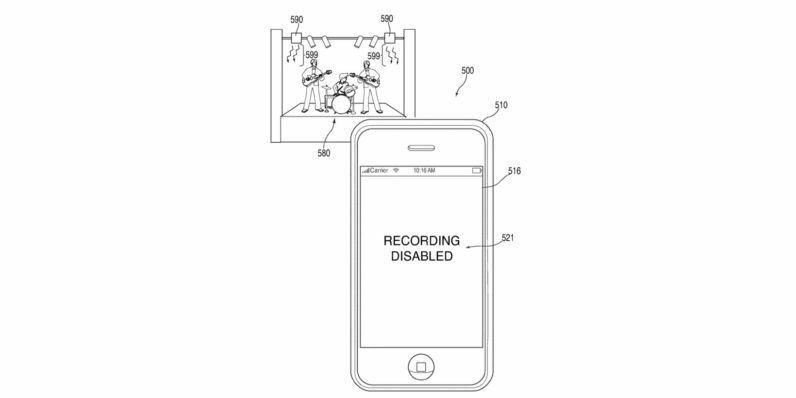 The idea is that an infrared emitter can be placed wherever recording may be prohibited – concert venues, for example – and beam signals with encoded data that can be picked up smartphone cameras. The signals can include instructions for the phone to disable video capturing. While the thought of having my camera remotely disabled really grinds my gears, I’m not polishing my pitchfork just yet. Just because the patent has been granted doesn’t mean Apple will begin building on it immediately. Plus, it mentions other applications that are less aggravating. For example, if you pointed your camera at a museum exhibit, infrared signals could beam information about what you’re looking at. Similarly, if you were at a store, you could aim your phone at a product and receive a tip about a discount on that item. Of course, these ideas might be better served by iBeacons. Are you for or against recording video at concerts? Should Apple build a phone camera blocking system? Let us know what you think in the comments.